Last month on this blog we announced our newest series, Air Campaign, which we will launch next year. We are delighted to see that so many people are excited about it, and so we wanted to keep you all updated on the development and launch of the series so far. 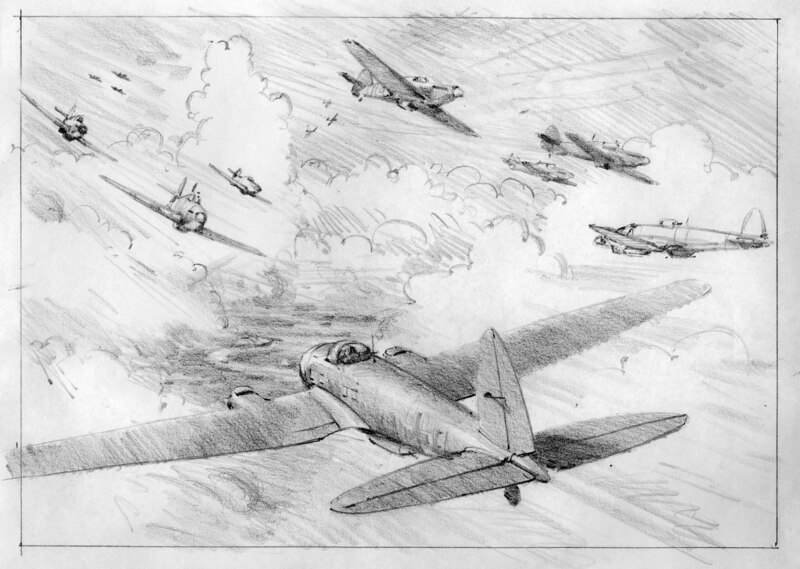 Today, we are going to share with you the three battle scene sketches for the first book in the series, ACM 1: The Battle of Britain 1940, fresh from the pad of Osprey artist extraordinaire Graham Turner. These are uncorrected first drafts and some aspects will be tweaked for the final plates, but we thought you’d still like to see them at their rawest. 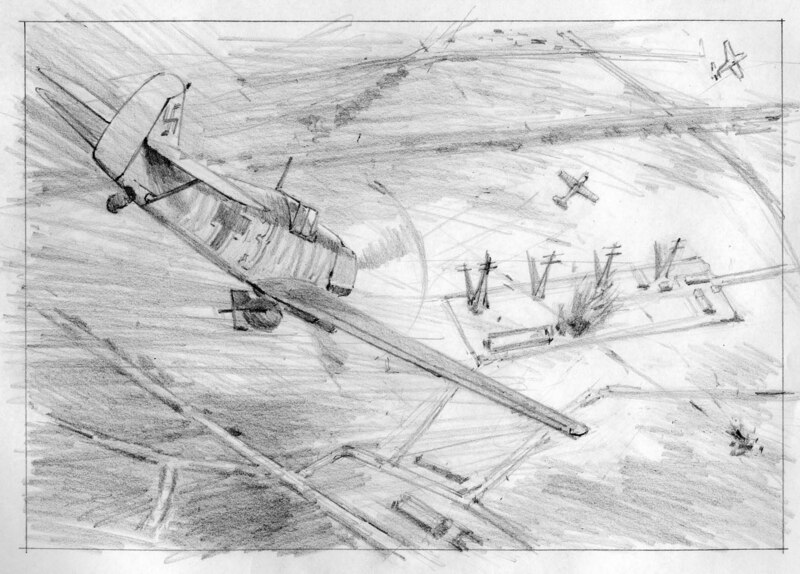 First, we have the Bf 109E-4/B ‘Jabo’ dive-bombing attack against the Swingate ‘Chain Home’ early-warning radar site near Dover on 12 August 1940 at 0900hrs. Using a 45-degree dive delivery angle, eight 250kg high-explosive bombs were dropped, destroying several huts inside the compound and slightly damaging the masts supporting the transmission aerials. None of the attackers were engaged by RAF interceptors or hit by AA fire and returned to Calais-Marck to be rearmed and refuelled for their midday mission, a strike against Manston airfield. After several hours ‘off-line’, repairs were completed to ‘Chain Home’ and radar plotting resumed in the early afternoon. The devastating Dornier Do 17Z air raid on RAF Biggin Hill on 31 August 1940 will be the subject of this plate. This raid was the fourth in a series of six over a three-day period from 30 August to 1 September, the result of which was that RAF Biggin Hill was devastated and virtually destroyed. However, through the tireless and exhausting efforts of numerous individuals it was restored to operation, although initially at a significantly reduced capability. 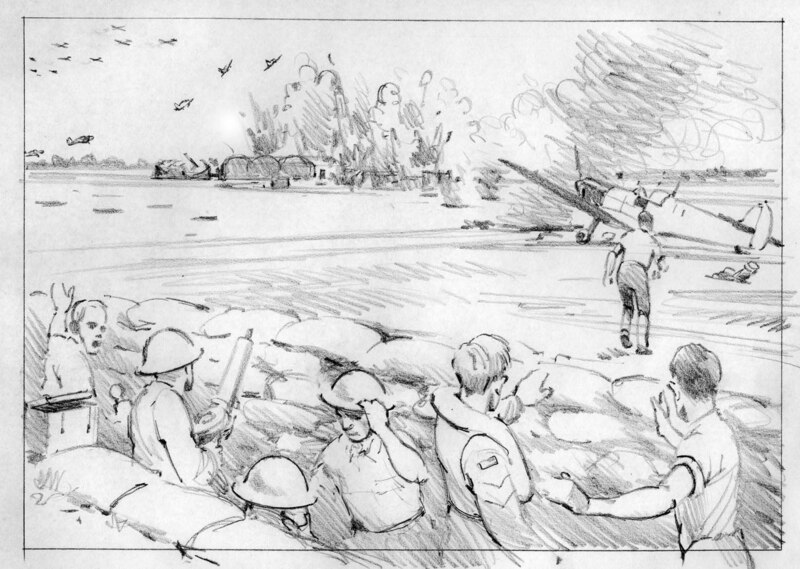 This plate will depict the moment that the main German force attacking London on 15 September met the Duxford ‘Big Wing’. 15 September is forever enshrined as ‘Battle of Britain Day’ because the outcome of the day’s air battle caused Hitler’s planned invasion of Britain to be indefinitely postponed. When the Do 17Zs and He 111Hs arrived over the target area, they found most of the dockyards obscured by thick, towering clouds and – almost simultaneously – were attacked head-on by the ‘Duxford Wing’, consisting of two Spitfire and three Hurricane squadrons. The result was the sudden loss of 11 of their 100 bombers and the shocking realisation that RAF Fighter Command was far from being the ‘spent force’ that Luftwaffe Intelligence had reassuredly reported. The Hurricanes in this plate are led by Squadron Leader Douglas Bader.